What really sent the nation's once-mighty steel industry into a near-fatal tailspin? It wasn't imports. A look at the history of the American steel industry should give some perspective about what to expect from President Donald Trump’s steel tariffs on imported steel and aluminum. Most of the damage didn’t come from China, or even imports. It was self-inflicted. World War II killed off foreign competition, almost literally, with the massive destruction of the industrial base in Germany and Japan, along with Moscow’s demands for reparations in the form of German mills being transplanted to the Soviet Union. By 1948, with America producing 40 percent of the world’s steel, U.S. mills employed nearly 700,000 workers. The enormous integrated mills, especially clustered around Chicago, Cleveland, and of course, Pittsburgh, were ideally positioned to feed the appetite of the roaring 1950s. Consumer demand pent up from the Great Depression let loose, construction of the Interstate Highway System began, and the Cold War stoked a need for military hardware. When Europe and Japan began rebuilding, they constructed mills using new and innovative technology. These “basic-oxygen” furnaces and continuous casting methods proved far more efficient and less expensive than steel produced by the open-hearth integrated mills in America. 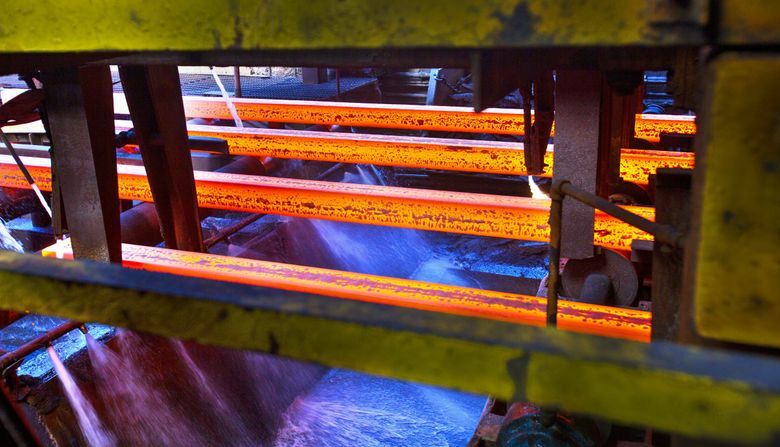 Rather than adopt the new process, executives at firms such as U.S. Steel, Bethlehem Steel and Republic Steel stubbornly stuck with their outmoded methods. Not until the 1960s did a few basic-oxygen plants open in the United States. Another misstep was using their riches for financial games rather than investing in productivity and innovation. For example, Armco, whose Middletown, Ohio, mill features in the book Hillbilly Elegy, tried to turn itself into a conglomerate in the early 1980s. It bought an insurance company. Many of the majors failed to adequately fund their pension programs when times were good, which would prove catastrophic later. Finally, Ken Iverson’s Nucor (which has an operation in Seattle) revolutionized steel production with its electric arc minimills. By the 1980s, more steel was being made from scrap than from the traditional base of mined iron ore. The minimills were ideally suited to this. Nucor so wanted to reinvent steelmaking that it preferred to train rookies than hire experienced steelworkers. Today, among the once mighty Big Steel companies, only U.S. Steel still survives. Nucor has entered the establishment by supporting the Trump tariffs, something Iverson (who died in 2002) scorned. The imports that gobsmacked complacent American steelmakers starting in the 1970s didn’t come from sweatshops. Rather, they were produced by well-paid workers in Europe and Japan. It was executive blunders here that left the domestic industry vulnerable to collapse. As for China, it directly accounts for 2 percent of total U.S. steel imports (even with so-called transshipment through other countries, the total is tiny). Trump’s tariffs won’t rebuild hundreds of thousands of steel jobs here. The 83,000 American mill workers today face a bigger threat than imports — it’s automation, with an extra push by Wall Street for added “shareholder value.” Trump’s plan, which undermines American leadership and antagonizes allies, does nothing to address that.